Hindu population of the areas that now constitute Pakistan was 15% in 1931 India Census. It declined to 14% in 1941 India Census. Then first Pakistan Census in 1951 showed it was 1.3% after the massive cross-border migration of both Hindus and Muslims in 1947. During the partition, 4.7 million Hindus and Sikhs migrated to India from what became Pakistan, while 6.5 million Muslims migrated from India to Pakistan. Since 1951, the Hindu population of what is now Pakistan has grown from 1.3% to 1.9% now. It would be interesting to find out if any Hindu citizen of Pakistan, faces problem in moving to any other part of Karachi. BTW I never saw any news in media regarding Hindus facing discrimination while renting/ buying an apartment/ house or kids joining school in Pakistan. your maps is complete mess. It is showing India, china having Islam majority and Indonesia and gulf countries as Hundu's. Plus there is no citation. You yourself made (fudged) this map. ANd how come Australia is not having enough christians. Anon: "It is showing India, china having Islam majority and Indonesia and gulf countries as Hundu's. " Read it carefully; it's a map of which religion is growing the fastest where, not the religion of the majority in each country. It's based on recent Pew Research findings. 1. The only data which pew research suggest is that the fertility rate of Hindu is 3.2. It is doubtful how many of these 3.2 children born on an average per Hindu lady actually make it to their first birthday. Hindus being highly marginalized community have almost no representation in Pakistani politics. Thus I doubt that the economic condition of Hindus and more importantly their lack of security in Pakistan will allow them to even live. 2. Pakistan even refuses to issue basic documentation to their Hindu minority : http://tribune.com.pk/story/878728/legally-wed-hindu-couples-still-waiting-for-legal-marriage-certificate , http://www.thenews.com.pk/Todays-News-4-298069-In-Pakistan-only-wedding-photos-can-prove-Hindus-marriages . Such lack of basic laws for minority like Hindus make it very difficult for them to access even the basic facilities such as insurance for pregnancy or birth certificates. In contrast India has a different civil code especially for Muslims to honour their (sick) tradition of marrying more than one wife. I dont know what you are trying to imply with this mess of an article but I doubt it conveys any positive thing about condition of minorities in Pakistan. Anon: " The only data which pew research suggest is that the fertility rate of Hindu is 3.2. It is doubtful how many of these 3.2 children born on an average per Hindu lady actually make it to their first birthday. " 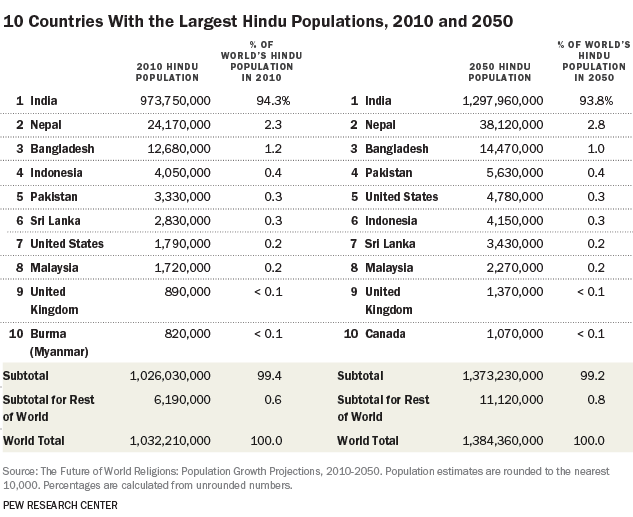 Pew data also shows Pakistani Hindu population increasing faster than the national population. Also, Census data shows percentage of Pakistan's Hindu population has been rising for several decades from 1.3% i first census in 1951 to 1.9% now. "In 1951, Hindus constituted 22 percent of the Pakistani population and the Hindu population was concentrated in East Pakistan which later became Bangladesh, while the Hindu population in West Pakistan was less than 2%. By 1998, the proportion of Hindus was down to around 1.7 percent." "A 2005 report by the National Commission for Justice and Peace, a non-profit organization in Pakistan, found that Pakistan Studies textbooks in Pakistan have been used to articulate the hatred that Pakistani policy-makers have attempted to inculcate towards the Hindus." "Vituperative animosities legitimise military and autocratic rule, nurturing a siege mentality. Pakistan Studies textbooks are an active site to represent India as a hostile neighbour", the report stated. 'The story of Pakistan’s past is intentionally written to be distinct from, and often in direct contrast with, interpretations of history found in India. From the government-issued textbooks, students are taught that Hindus are backward and superstitious.' Further the report stated "Textbooks reflect intentional obfuscation. Today’s students, citizens of Pakistan and its future leaders are the victims of these partial truths". Many Libraries at US Universities(that have South Asia Studies department) house propaganda or hate literature text books from countries around the world but one has to read it there - you cannot check it out. At Georgetown, there is a entire section devoted to Pakistan which includes School Curriculum books. A considerably smaller area covers books from a much bigger country - India! Prakash quoting Amnesty:"In 1951, Hindus constituted 22 percent of the Pakistani population and the Hindu population was concentrated in East Pakistan which later became Bangladesh, while the Hindu population in West Pakistan was less than 2%. By 1998, the proportion of Hindus was down to around 1.7 percent." "It is this author’s contention that the above conclusion is erroneous and that decimation, one which led to a decrease in the Hindu population of Pakistan by 90 per cent, never took 50 years to materialise. Decimation did happen, but in the months preceding or subsequent to the date of the partition. In other words, the cataclysmic reduction of the Hindu population of Pakistan had taken not 50 years but, rather, half a decade....From a healthy 14 per cent in 1941 – a figure some analysts say had reached 16 per cent by 1947 – the Hindu population came down to just 1.3 per cent in 1951. The decimation took five years not 50. After 1951, the Hindu population has hovered around the same 1.5-2 per cent mark." KARACHI (Dunya News) – Highly educated in London and employed at a prestigious company in Malaysia, the man who used Skype to carry out extortion activities in Pakistan’s largest metropolitan has been arrested by the Special Investigation Unit (SIU), Dunya News reported. According to details, man identified as Vinod Kumar acquired the taste of gambling in casinos while studying in London and continued while working in Malaysia that resulted in him exhausting all his savings. Upon return to Pakistan, Kumar resorted to illegal means in order to continue his lavish spending. Reportedly, the extortionist heavily used social media especially the communication tool Skype to deliver threats and carry out his activities. He reportedly received Rs 20 lakh from employees of an insurance company at one time, 10 lakh the second time and got arrested while receiving the 30 lakh installment the third time. The Special Investigation Unit said that the suspect is being investigated and that the preliminary investigation has shown that the suspect’s friends provided him all the details about his targeted companies. "In Pakistan, patients used to treat us like gods. Here we are forced to beg for jobs to stay alive," says Dr Jayram Lohana, 46, who used to earn Rs 1 lakh a month in Sindh before he came to India in 2012. In Ahmedabad, he works at his cousin's mobile store right next to the airport. "We escaped terrorists and found safety here, but nobody is willing to help us put our lives back on track," he says....As per the rules, Pakistanis can apply for Indian citizenship after staying here for seven years. The process takes another two to three years and then one encounters the red tape at MCI. Dr Girdharilal Sinchani, 42, knows it all too well. He did his MBBS from Karachi in 1997 and came to India in 2001. He got citizenship in February 2014 but has been waiting for MCI approval for the past 14 months. "We came here hoping for a better life, but while there is safety, we can't get jobs or buy property to live or do business." Ajay: " magine the threat and insecurity he must have faced in Pak to give up his career for this"
THE official death toll from the September 11th terrorist attacks in 2001 was 2,974. But in 2002 America's death toll on the roads grew by more than 1,500—casualties of the terrorism-inspired exodus from safe aeroplanes to dangerous motor cars. A swan washes up on a British shore, dead from bird flu, and the press panics, while the 3,000 people who die every year on the country's roads (13 times the number of people who have ever died from bird flu) go largely unremarked. Human beings are notoriously bad at dealing with risk. Two new books explore why, and investigate the effects that misunderstanding risks can have on public policy. The first, an excellent work by a Canadian writer, Dan Gardner, is a broad meditation on the nature of risk, beginning with a psychological explanation for why people find it so difficult to cope. Mr Gardner analyses everything from the media's predilection for irrational scare stories to the cynical use of fear by politicians pushing a particular agenda. His take on terrorism in the book's penultimate chapter is refreshing. He punctures ludicrous claims that “this conflict is a fight to save the civilised world” (George Bush) or that terrorism's threat is “existential” (Tony Blair), and expertly deflates the more self-serving statements made by the terrorism industry that has mushroomed since the September 11th attacks. Mr Gardner never falls into the trap of becoming frustrated and embittered by the waste and needless worry that he is documenting. A personal anecdote about an unwise foray into a Nigerian slum in search of a stolen wallet disposes of the idea that the author is immune to the foibles he describes. What could easily have been a catalogue of misgovernance and stupidity instead becomes a cheery corrective to modern paranoia. Expressing dissatisfaction over the restoration work of a Hindu temple in Khyber-Pakhtunkhwa, Pakistan’s Supreme Court has ordered the provincial government to hire a renowned architect for rebuilding the shrine destroyed by fanatics in 1997. A three-judge Supreme Court bench headed by Chief Justice Jawwad S Khawaja on Tuesday asked the Khyber-Pakhtunkhwa authorities to come up with a plan to rebuild the Shri Paramhans Ji Maharaj’s Samadhi in Teri village of Karak district. The chief justice said that the order must not be defied and should be implemented at all cost. The temple has been partially restored, but the court expressed dissatisfaction over it and order Karak Deputy Commissioner (DC) Shoaib Jadoon and provincial Home Secretary Arbab Mohammad Arif to hire an expert architect for proper restoration and renovation. On April 16, the apex court had ordered the Khyber- Pakhtunkhwa government to restore and rebuild the temple, whose preservation has led to a rift between the minority community and local religious leaders. During the hearing, the DC informed the court that its earlier order about the restoration of the temple had been carried out and a boundary wall was built around it. But the court said that the efforts put in by the provincial administration were not enough and proposed construction of a new building instead of just erecting boundary walls. The Chief Justice said the court could ask the architect to conserve the temple. The court asked the DC to report the court about the progress made in the restoration work during the next hearing on September 7. The Hindu shrine was built at a place where Shri Paramhans Ji Maharaj died in 1919 and buried in Teri village. His followers were regularly visiting the place for worship till 1997 when some Muslim fanatics destroyed the temple and the land was allegedly occupied by a local influential cleric Mufti Iftikharuddin. Thank you for your article, it makes me get a new perspective about the state of pakistan. An exceptionally bright student of PakTurk International School in Jamshoro has brought home a gold medal after competing in Math Challenge V hosted by the Pan-Asia International School in Bangkok. Making Pakistan proud, Rajinish Aneel Bhatia of grade 7 bagged the gold medal in the international math competition. Three other students from the same school also secured silver and bronze medals. Harun Yilmaz of grade 8 won a silver medal while Abdul Wasay Kandhir and Abdul Wasay Memon, of grade 7 and 8 respectively, bagged a bronze medal each. Schools from all over Asia participated in the Math Challenge V held on November 17 and 18. The competition aims to encourage students to study and excel in math and critical thinking. The prizes for gold, silver and bronze medalists are 3,000 THB, 2,100 THB, 1,500 THB respectively. Ever wondered what it would be like to be part of the minority community in a supposedly religious nation, more specifically for a Hindu in Pakistan? Well, turns out it is a pretty regular affair, no Bollywood melodrama there. social entrepreneur with the PEAD foundation in Islamabad - paints a colourful picture of his home town in Umerkot, Sindh. "We are a happy family with different identities. As a nation, we share the same food, clothes, buildings, laws, and events. All these elements are what bring us together under the same umbrella, then why do we look for reasons to hate each other?" Raj wrote in his blog post. Raj visited India last month for a conference in Chandigarh. He says he was "bombarded with questions regarding the status of Hindus in Pakistan." To which he replied: "I have always felt like a star of my country and I feel safe, which is why I am as loyal as any Muslim in the country. Pakistan doesn’t just belong to Muslims; it belongs to all the residents of its soil." Raj argues with the common widespread notion that minorities in Pakistan are treated differently or pitied. He claims to be as much a part of the soil as the friends and families he has grown up with, and considers it a blessing to have been born to his homeland. At least, all the ladies here reminded him that his name was easy to remember. "I believe I have Shahrukh Khan to thank for that," he says. en as Pakistani-origin singer Adnan Sami was granted Indian citizenship, many disillusioned families are going back to the neighbouring country after spending many years in Gujarat. In the past one year, at least 100 families — most of them Sindhis and Kutchi Gujaratis — have returned to Pakistan after spending many years in Gujarat waiting for the elusive Indian citizenship. Many more are packing their bags saying their 'Ghar Wapsi' to India had proved an illusion. Motiram Khatri, 37, who fled Pakistan in 2009 to settle in Ahmedabad, has applied to go back to Sindh. Khatri, a grocer in Pakistan, had started a mobile shop in Dehgam on the city outskirts to sustain his family of five. However, a police case was filed against him allegedly for violating visa rules which prohibit him from stepping out of the city. "I could not get any job or place on rent in Ahmedabad. What crime did I commit if I went just 15 km from the city for my family's survival?" asked Khatri, who said he will revive his grocery business in Sindh once he returns to Pakistan. Rambhai Bhimani, president of the Ahmedabad-Thara Lohana Samaj, confirmed that in the past one year, nearly 100 Hindu families, who had fled Pakistan and come to Gujarat for security and a better life, had gone back. "It is ironical, Hindu organizations have launched 'Ghar Wapsi' campaign to bring Hindus who had converted to Islam back into their fold but they do little to embrace those who are their own," said Bhimani. Dr Ramesh Lohana, 38, left his successful practice in Karachi in December 2012 for a secure life in Ahmedabad. Now, a disillusioned man, he is waiting for his children's exams to be over so that he can go back to Pakistan. "My practice earned me Rs 2.5 lakh a month. Here, no hospital was willing to give me a job. I was forced to take up a supervisory job in a garments shop for Rs 25,000. Authorities and ordinary people look at us with suspicion. We feel like second-class citizens," said Dr Lohana who is preparing to leave in April. Making for a historic moment, a Sikh ranger from Pakistan participated in the traditional Beating the Retreat Ceremony at Wagah Border, for the first time ever. People from both the sides of the border welcomed the Sikh ranger with a huge round of applause when he came for the ceremony on Thursday evening. The surrounding filled with the sound of claps when he shook hands with the Indian ranger. Named Amarjeet Singh, the ranger is the residence of Nankana Sahib, the holy city of Sikhs situated in Pakistan. He is said to be the first person ever from Sikh community to join the Pakistani army. Media reports say that he has joined the Pakistan army in 2005 and completed training this year, after which he was included in the defences forces on the Wagah border. Talking about his duty for Pakistan, Amarjeet said that he is proud of being a part of the Pakistani army and would happy to lay down his life for the nation. Like Amarjeet, Gyan Chand was the first Hindu to join the Pakistani army in 2009. On the other hand, a Hindu ranger named Ashok Kumar lost his life while fighting for the Islamic nation in Waziristan. Though, Pakistan didn’t give him the status of a martyr which led to a serious controversy later. Now, with Sikh ranger’s entry into Pakistan army, we hope the history doesn’t repeat itself. l the decks have been cleared for Pakistani resident Hawa Devi and two other of the family for her departure to Pakistan on Friday after which she boarded the Thar Express on Friday night for her destination. While confirming the departure permission to them, ASP (CID) Bharat Meghwal said that they have been ordered to leave the country after the matter was cleared by the higher authorities on top level. Then based on the report in the TOI, the State's Human Rights Commission took the cognisance of the matter and called a report from the officials. Union Foreign affairs minister Sushma Swaraj also talk to Hindu Singh Sodha, President of the Seemant Lok Sangthan seeking details of the case. "After submitting the report, she invited me to Delhi and talked about the issue in detail assuring to pave the way for her departure. I am thankful that the new year has brought a good message for Hawa Devi and now she will be able to unite with her family," said Sodha. DC: "Good, so it is established that you know basic maths. So amongst the "fastest growing Hindu population" what percentage of them have position of power, money, fame and status? Please dig more into this and I am sure you will get startling numbers, may be the number has increased from 3 individuals in 1951 to 5 in 2016. Great job Pakistan, you do care about your minorities.﻿"
Bigotry is no substitute for knowledge. There are Hindu politicians, members of parliament, ministers, bureaucrats, judges, lawyers, engineers, doctors, artists, fashion designers, etc in Pakistan. According to a report by NDTV, right-wing Hindu activists protested against the wedding outside the bride's home on 12 April, calling it "love jihad" and alleging that Shakeel, who is a Muslim, was forcing Ashitha, a Hindu, to convert to Islam by marrying her. Since the time the two families collectively agreed to the marriage, members of Bajrang Dal and Mandya Vokkaligara Sangha opposed, claiming it was a case of love jihad. "A group of people claiming to be Bajrang Dal activists came to our house on 12 April and said they wanted to guide my daughter. They demanded that she abandon her plans to marry Shakeel. When she refused, they made some remarks and my daughter started crying,” said Ashitha's mother, Uma Devi on speaking to The Indian Express. "We told Bajrang Dal activists it is not love jihad, but a marriage between children of two friends. But they were not ready to listen to us," Dr Narendra Babu, Ashitha's father, was quoted saying by The Times of India. After the Hindu groups had spoken to the parents, they staged protests outside the residence of the girl shouting love jihad slogan. The group dispersed after police intervention. According to a report by The Hindu, local Bharatiya Janata Party (BJP), Bajrang Dal and Vishwa Hindu Parishad (VHP) activists, terming them a case of 'love jihad', had launched a campaign against the families on Tuesday. It was after police intervention that the protesters dispersed. "Even if I get married to a Hindu guy, I have to practise traditions of his family. I'm in love with him and I'm getting happily married with the consent of our parents, " Ashitha had said, as reported by Deccan Chronicle. I was saddened to know that hindu sonly after 69 years of independence got the right even to celebrate their festival such as diwali and holi officially. There is not even 1 important minister in pakistan who is a hindu unlike India. Decimating the hindus and sikhs from pakistan is a sad reflection of the society of Pakistan , which breeds intolerance and ultimately breakdown. I wish every body is treated as human with humane approach. An Interview of a #Pakistani #Hindu activist about breaking stereotypes! #Hindus live peacefully in #Pakistan. Could you tell us about you, where you live, a bit about your family, what you do, etc? I am Dr. Rajesh Kumar, Youth and Minority rights activist, graduated as a Medical Doctor from Liaquat university of Medical & Health Sciences, Jamshoro, Sindh. Pursuing post graduation in the field of Psychiatric Medicine from the same insitution. I was born in a town namely Thana Bula Khan, a Hindu Dominant town of Sindh, serving the biggest economy to the country because of most people into Business. Half of family is into medical profession, so my father inspired me to be a medical Doctor like him. Since very begining of college days, I have been actively participatig in Youth led conferences about Interfaith Harmony, Democracy, Leadership, Peace, Climate Change and Youth empowement in Pakistan, India and United states. Are there many Hindu families in Pakistan? 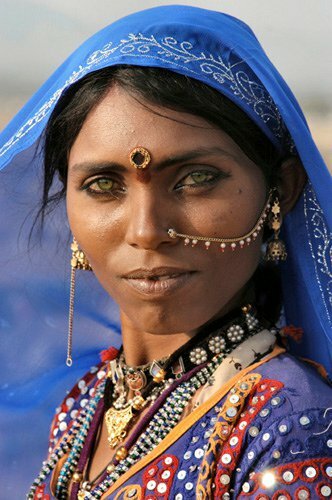 In Pakistan, Hindus are living very peacefully since thousands of years around the Indus Valley. Hindus were the real owners of the land. Since ages, Hindus have a very rich background. They are business oriented, educationists, philanthropists who always believed in the message of Humanity, Interfaith Harmony, Tranquility and Peace. Currently Hindus make up around two percent of the country’s 200 million people and they mostly live in southern Sindh province. People compare pre and post 1971 statistics and assume that the Hindu population in Pakistan has drastically reduced when it is clear that Pakistan was dismembered in 1971 and the statistics would of course be different for only the western part of what was total of east and west Pakistan, then. Have you ever been in a situation where you have been asked to ‘Go to India’ because you are a Hindu? In my case, answer would be very simple, Just because I have been born into a particular religion, no one has ever told me off that I belong to a certain country. Infact in cities other than my birth city, I am treated like a celebrity. People are curious about the hindu customs and cultures and ask me a lot of questions. Indeed some people have come to shake hand with me only to see what a Hindu looks like. But if one were to believe the media, then we are victims of religious extremism, Intolerance, religious discrimination and forceful religious conversion. Despite of having some basic and minor issues, We do celebrate each of our Festival including Dewali, Holi, Thadri, Raksha Bandhan with full Zeal and Zest with our fellow Countrymen. I vividly remember very few-off situations when during a cricket match I was asked who I support. By then, I failed to comprehend the mindset behind the question. I personally believe that there are ignorant people on both sides of the border. Lunatic people using these ‘Go to India’ or ‘Go to Pakistan’ tags and those setting examples of “Ghar wapsi” and “love jihad” are doing nothing but are only bringing disgrace to their communities and country. Do you think Hindus and Muslims can live peacefully? Since I belong to Sindh, I believe in the proposition that Hindus and Muslims can live peacefully. The cultural values of Sindh are mixture of Sufi Islam & Hinduism. Many cities of Sindh are exemplary in that. At times, a number of Muslim friends ask me, if they can join me for holi celebrations and can share the joys. Similarly, I feel no hesitation in celebrating the Eid with my Pakistani brothers and sisters. I believe that only thing which separates us from each other is the borders which we make in our mind and here I will second the Nelson Mandela that “No one is born hating another person because of the color of his skin, or his background, or his religion. People must learn to hate, and if they can learn to hate, they can be taught to love, for love comes more naturally to the human heart than its opposite” . Such a fate has befallen a Christian family who fled persecution in Pakistan only to realise later on that their situation has gone from bad to worse. Interviewed by CBN News recently, Mustaq Faisal said he and his family had no choice but to abandon their home in Pakistan and flee to Thailand after he and his family were marked for death by their Muslim neighbours last year. In quivering voice and eyes filled with tears, Faisal recalled an incident when their neighbours accused him of tearing pages from the Quran and threatened to kill his family in revenge. "I was so scared. I told them I would never do anything like that to their holy book, but they didn't believe me," he said. Faisal became so fearful that he decided to take his wife, Samina, and son, Joshua, to Thailand, imagining the latter as a country where they can start a new life and freely practice their Christian faith without being threatened by Muslim zealots. He and his family filed an asylum application with the U.N. However, six months after arriving in Thailand, the U.N. agency responsible for protecting refugees still could not issue them any asylum document. With his family's three-month tourist visa in Thailand having lapsed, Thai immigration police came to arrest them since overstaying a tourist visa is illegal in this Southeast Asian country. "I was not at home when the Thai police came to our apartment," Faisal said. "My wife told them she was a heart patient and that they should not arrest her, but they didn't listen." The police arrested Samina and Joshua and took them to the Immigration Detention Center (IDC). Samina's heart condition worsened and she got very ill last Dec. 20, but Thai authorities refused to bring her to a hospital. Faisal went to the U.N. office and pleaded officials there to help his sick wife. "I kept asking, I kept crying, but they did not listen to me," he told CBN News. He also begged the guards in the detention facility to at least heart medications to her wife. "I told them that if you don't do anything, she will die," he said. His plea fell on deaf ears. Faisal's wife and son were detained in a facility where the illegal migrants were denied access to healthcare and medicines, according to Wilson Chowdhry, the director of British Pakistani Christian Association. The facility houses 200 people crammed in rooms that barely fit 100 with only two toilets, according to Chowdhry. "The stench as you walk in is overpowering," the Christian human rights advocate told CBS News. Moreover, some of the male detainees were "chained like dogs," he added. On Dec. 30, 2015, the U.N. finally responded to Faisal's asylum plea, but it was too late for his wife Samina who died in detention. "My life is so terrible right now," Faisal said as tears streamed down his cheek. "We faced so many difficulties in Pakistan and that's why we escaped to Thailand. Now I'm here and my wife is dead! What am I supposed to do? My son keeps asking, 'Where is mommy?' But I don't have the courage to tell him the truth." Six other Pakistani Christian refugees have also died in Thai detention centres. For the five days of the autumn festival, Mithi celebrates like no-one else in Pakistan. As soon as the evening pooja finishes, the sleepy desert town of over 25,000 turns into a carnival of lights. It was to witness this transformation that I travelled to Mithi last year with a writer and a business student. The writer was working on an assignment and had visited Thar a few times in the past, while the student had volunteered to assist her in the project. Our outlooks and ambitions were very different, but somehow experiencing Diwali in Mithi was important to all of us. Mithi, after all, is among the few towns in Pakistan where Muslims are not in majority, a place where both Hindus and Muslims have lived together harmoniously. Its Diwali is a symbol of this amity, an experience that should be on everyone’s bucket list. We stopped at some crowded fireworks shops, fighting at first for space. But then people realised there were women amongst them. Out of respect, they let the writer and the student select fireworks. It was then I noticed that there were no women in the bazaar. The writer, as if reading my mind, turned and told me that the women must be busy at pooja. We closed the deal and made our way to Krishna Mandir at the other end of the bazaar. The temple’s entrance was decorated with fairy lights. It seemed to have undergone many renovations and, in places, I could see fragments of old colourful Belgian tiles below newer gaudy ones. I walked in anxiously, fearing that people may not appreciate an outsider filming them. The writer sensed the hesitation and led me to the inner portico, striking the temple bell while crossing it. No-one seemed to care – people were busy lighting diyas, performing pooja, taking selfies and setting up fireworks. As another wave of people came in, the writer said that perhaps the pooja was over. In a first for Pakistan, a bridge constructed in Sindh province's Ghotki district has been named after a Hindu temple, a lawmaker from the neighbouring country has claimed. A member of the Pakistan national assembly from Larkana, Vijay Lal, informed TOI on Monday that the Hindu community in Sindh had been for long demanding to connect Sacho Satram Dham (SSD) and Devri Sahib temples at Raharki village, Ghotki, which are divided by a river. Earlier, devotees had to take a long, tedious route to reach the other side of the river to pay obeisance at the temple, he said. "It was almost impossible for them to travel at night," he said. Lal said he had taken up the issue with former Pakistan president Asif Ali Zardari and, on getting his nod, construction of the 1.25km bridge began. Pakistan Peoples Party chairman Bilawal Bhutto Zardari inaugurated the structure, costing 24 crore in Pakistani Rupees and named SSD Century Celebration Bridge, on November 4. SSD is one of biggest Hindu places of worship in Sindh and is spread over 300 acres. Lal said more than 60,000 Hindus lived in Ghotki. Lal has also said reports of persecution of Hindus and Sikhs in the neighbouring country had been 'exaggerated'. He also rubbished reports that young women were being forced to convert to Islam. An Indian groom and Pakistani bride were finally able to happily tie knot after the unnerving visa issue was resolved. It all happened when the bride Priya Bachchani and her family got no response from the Indian High Commission after applying for the visa in August. As the chances got bleak, the groom Naresh Tewani from Jodhpur in North India tagged India’s Foreign Minister Sushma Swaraj on Twitter, seeking her urgent help in the matter. In reply to the tweet, Sushma assured Naresh that all members of the bride’s family will get visas to attend the wedding. As the matter was settled, the couple thanked the minister for her assistance. Naresh Tewani and Priya Bachchani had been engaged for three years and get married on November 7. "Love triumphs ultimately. Love prevails in both the countries and that’s why we are here," the bride’s father, Giridharlal Bachchani told to BBC Urdu. The groom’s father said he was relieved after facing "some nervous weeks due to visa delays". India and Pakistan have been at loggerheads since their independence from Britain in 1947 and have fought three wars, including two of the divided territory of Kashmir which both countries claim as their own in full. Military and diplomatic tensions have soared since a recent raid on an Indian army base near the de-facto border dividing Kashmir killed 19 soldiers, the worst such attack in more than a decade. Hindus living in the Pakistani capital would soon have their major demands met after a decision by authorities to allocate land for a temple, community centre and cremation ground. The decision was taken yesterday in a meeting of Capital Development Authority (CDA), which is responsible for development and civil amenities in Islamabad. The Express Tribune reported that CDA approved the allocation of a half-acre plot of land in Sector H-9 of the capital for a Hindu temple, community centre and cremation ground in the federal capital. "It was a longstanding demand of the Hindu community which has finally been fulfilled," the paper reported. There are around 800 Hindus living in Islamabad, and in the absence of a temple, they were forced to celebrate Diwali and other religious festivities at home. As there was no crematorium in the city, they also had to take the bodies either to Rawalpindi or to their hometowns for cremation. The only large temple in the twin cities of Islamabad and Rawalpindi is Krishna Mandir in Saddar although a few smaller ones exist in residential parts of Rawalpindi cantonment. The CDA board allocated the plot close to one that had already been allocated to the All Pakistan Buddhist Society. Following the partition, most of the wealthy Hindus of Hyderabad fled to India. Only some of them, mainly the Amils and the Lohanas, remained in the town after Pakistan came into being, Ran-ji said. A few had flourished in the new country but, particularly in the aftermath of the Babri Masjid in India in 1992 and the ensuing mass violence against Muslims across the border, what had been a trickle of Sindhi Hindu migrants to India had threatened to turn into a flood. Hundreds of Hindu temples, many of them small roadside shrines, others large, unused structures, had been destroyed across Pakistan, including in Sindh, where most the country's Hindus lived. Mercifully, Ram-ji said, less than a score of Hindus were killed in the violence, nothing compared to the thousands of Muslims who were slaughtered by Hindu mobs in India. ....Increasing number of Sindhi Hindu merchants had begun to send at least one of their sons to settle in India and set up business there, so that in the event of the conditions for Hindus in Sindh worsening they could, if they felt compelled to, migrate en masse across the border. But this was not an option for the vast majority of Sindh's Hindus. Eighty percent of the Hindus in the province were desperately impoverished Dalits....Procuring a passport, traveling more than a thousand miles to Islamabad to apply for a visa at the Indian High Commission, and the taking the train from Lahore to Amritsar was much beyond their meager means. But, even if they managed to get to India, were would they go? Who would employ them? "And", Ram-ji added matter-of-factly, "in India, too, they would still be treated as Untouchables". "Many Dalits who migrated (whether at the time of partition or subsequently) faced humiliation and discrimination at the hands of caste Hindus in India after Partition. In some cases, they were taken by separate ships or trains. Tillo Jethmalani, who was subsequently posted as camp commandant at Marwar Junction, recalls how one goods train filled with Dalit refugees from Sindh arrived in the middle of Rajasthan winter night, with Dalits lying freezing and semi-conscious inside the goods wagons. Even in refugee camps in India, Dalits were given separate living quarters and dining areas, thus maintaining the status quo of ghettoization." India is also one of the world’s top destinations for international migrants. As of 2015, about 5.2 million immigrants live in India, making it the 12th-largest immigrant population in the world. The overwhelming majority of India’s immigrants are from neighboring countries such as Bangladesh (3.2 million), Pakistan (1.1 million), Nepal (540,000) and Sri Lanka (160,000). India’s religious minorities have been more likely to migrate internationally. Religious minorities make up a larger share of India’s international migrant population than they do among the nation’s domestic population, according to 2010 Pew Research Center estimates. For example, about 19% of the Indian international migrant population was Christian, compared with only 3% of the population in India. Similarly, an estimated 27% of the Indian international migrant population was Muslim, compared with 14% of the population in India. The reverse is true for Hindus: Only 45% of India’s international migrant population was Hindu, compared with 80% of the population in India. There was one deer by the park near my home. Of late I have been noticing three deers. We are happy that there has been a 200% appreciation and this has to be better than any preservation programs in any part of the world. Wanted to share this with you and your viewers. Sriman: "here was one deer by the park near my home. Of late I have been noticing three deers. We are happy that there has been a 200% appreciation and this has to be better than any preservation programs in any part of the world." I'd agree with the analogy if the numbers were in millions, not ones or twos. BTW, Pakistan has 2 million Indian migrants, the 2nd largest population of Indian migrants in the world after UAE. 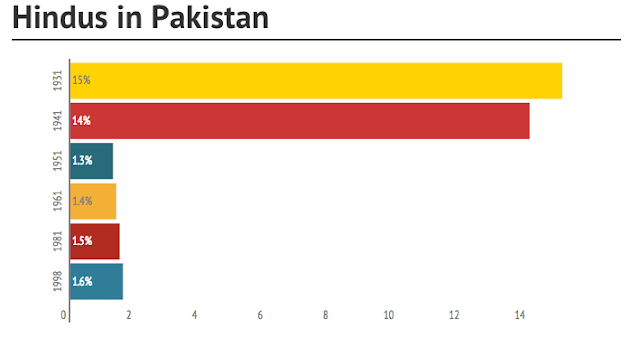 There are more Indian migrants in Pakistan than in the United States. Meanwhile, the number of Pakistani migrants in India is only 1 million, a half of Indian migrants in Pakistan, according to Pew Research. islam is a social malady which needs to be eradicated as soon as possible . pakistan is a grabage country . i m from india /. 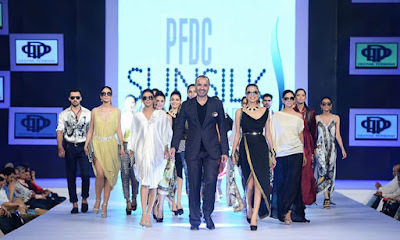 KARACHI: Renowned fashion designer Deepak Perwani, along with almost a dozen other people, announced joining the Muttahida Qaumi Movement-Pakistan (MQM-P) on Sunday. The announcement was made at a press conference held by MQM-P chief Farooq Sattar in Karachi. Other who announced joining the party included former bureaucrat Javed Hanif, trader Khurram Rasool, Saman Laiq Abbasi, former PTI leader Farooq Dadi, Alamgir Feroz, Taufeeq Kochin and Imtiaz Ali. Hello Mr. Haq, would you have any knowledge on the current localities of Hindu population in Karachi? Where do they reside and their numbers? safalta: "would you have any knowledge on the current localities of Hindu population in Karachi? Where do they reside and their numbers?" I don't have such details. I don't believe Hindus are ghetto-ized in Karachi. They live in the same neighborhoods as Muslims. Pakistan People’s Party has nominated Krishna Kumari, a Kolhi woman belonging to a remote village in Nagarparkar district of Thar, to contest for a general seat during the upcoming Senate election. Kumari is a social activist who joined PPP along with her brother, who was elected chairman of union council Berano. She has reportedly been asked by the party leadership to file nomination papers to contest the upcoming Senate election on PPP ticket. Born to a poor peasant Jugno Kolhi in February 1979, Kumari and her family members spent nearly three years in a private jail allegedly owned by the landlord of Kunri of Umerkot district. She was a grade 3 student at the time when held captive. Kumari was married to Lalchand at the age of 16, when she was studying in 9th grade. However, her husband supported her in pursuing studies, as later in 2013 she did masters in sociology from Sindh University. She also actively participated and worked for the rights of downtrodden people of marginalised communities living in Thar and other areas. When contacted, Kumari told Dawn that she was given assurances by senior party leaders that they would get her elected as Senator “to set a new precedent and empower women from remote areas and minority communities”. Provincial minister Syed Sardar Ali Shah, MNA Dr Nafisa Shah, MPA Dr Mehesh Kumar Malani and other PPP leaders had requested the party leadership in this regard, she said. "I was called by Bilawal Bhutto and Faryal Talpur a few days back. They said they will allot me the ticket to contest the election to become a senator on a general seat from Sindh," Kumari maintained. Kumari said she has made all the arrangements and documentation needed to file her nomination papers after she was made the candidate by party leaders. PPP lawmaker from Thar Dr Mahesh Kumar Malani, when contacted by Dawn, confirmed that the party had decided to give Kumari a ticket and hoped that a Kolhi girl — from the family of the valiant freedom fighter Rooplo Kolhi — would be elected with majority votes. Rooplo Kolhi had waged a war against the invading British colonialist forces when they had attacked Sindh from Nagarparkar side in 1857. Subsequently, he was arrested and hanged by the Britishers on August 22, 1858. Dr Malani termed it a great decision by the party chairman to select a Thari woman to represent Thar in the Upper House. Malani polled 19,379 more votes than his nearest rival, Arbab Zakaullah, of the Grand Democratic Alliance, which had an electoral understanding with Imran Khan’s Pakistan Tehreek-e-Insaf in Sindh. In the fray were 12 other candidates, all Muslims, who together polled 28,696 votes. Theoretically, it can be argued that Hindus consolidated behind Malani and Muslim votes split, consequently giving Malani the seat. This point was made by Tehreek-e-Insaf’s Ramesh Kumar Vankwani, a nominated Hindu member of the outgoing National Assembly. “Had I stood, Hindu votes would have been divided and Malani would not have won,” he said. Vankwani said that he had told Khan that he wished to stand from the Tharparkar seat that was given to the Grand Democratic Alliance. Three Hindu candidates of the Pakistan Peoples Party (PPP) were elected from the Muslim-majority areas in Pakistan’s Sindh province in the 25 July general elections, a media report said on Tuesday, 31 July. Mahesh Malani won a National Assembly seat from Tharparkar (NA-222) , while Hari Ram Kishwari Lal and Jamshoro’s Giyanoo Mal alias Giyan Chand Essrani were elected from the provincial assembly seats PS-147 and PS-81, respectively, the Daily Times reported.